As we all sat staring at three large monitors in the front of the room, the remotely operated vehicle (ROV) Jason hung on to a borehole observatory with one hydraulic arm as the other arm plugged our sampling equipment into a valve. The ROV was about 4,500 meters under the ship, and we were preparing to collect water from over 200 meters below the seafloor, accessing fluid harboring an underexplored microbial community in the basaltic aquifers that exist there. We were in the middle of the Atlantic Ocean at a site referred to as North Pond where multiple Circulation Obviation Retrofit Kit (CORK) observatories were previously installed, allowing us to use an ROV to collect fluids flowing under the seafloor. It’s been theorized that the amount of water in the ocean’s crust is equal to ~2% of the total volume of the ocean! However, even though it represents an extensive reservoir of microbes, this environment is not well understood. The essential roles that microbes might play in making this stark, cold environment habitable has yet to be totally figured out. Modified Figure 1 from Meyer et al., A distinct and active bacterial community in cold oxygenated fluids circulating beneath the western flank of the Mid-Atlantic ridge. (2016) Diagram of the CORK observatories located at North Pond. Elizabeth Trembath-Reichert from Julie Huber’s laboratory at Woods Hole Oceanographic Institution (WHOI) set up a suite of experiments with the fluids we collected at North Pond, along with assistance from Ben Tully currently at USC, and Megan Mullis at Texas A&M. The main theme of their experiments was understanding differences among heterotrophic (produce their own organic carbon) and autotrophic (rely on readily available organic carbon) microbes inhabiting crustal fluid. While they aren’t as abundant as what has been reported in sediments (~109 cells / mL) or the water column (~106 cells/mL), previous studies have found 103 to 104 cells / mL in fluid samples from under the seafloor. These communities are distinct from their cousins inhabiting oceanic bottom water, even when the chemistry of the water is very similar. The Huber group set up experiments to address who was there, in the microbial sense, and what they were doing. To understand the who, a metagenomics approach was employed, using both the fluids in sampling bags brought up to the ship and filters on Jason so that we could pass about 15 liters of subseafloor fluid through in situ. The plan is to extract the DNA on the filters and obtain metagenomes from these samples, ultimately painting a sequence driven picture of the microbial diversity in the fluid samples. Just a few months ago, an extensive assessment of microbial community structure in North Pond was published in ISME by Tully et al., including data from 21 samples collected over the course of two years and representing the most detailed window into microbial diversity at this site to date. Figure 2 from Tully et al., A dynamic microbial community with high functional redundancy inhabits the cold, oxic subseafloor aquifer (2017). Evidence for the microbial diversity in them thar basaltic aquifers. While metagenomics is certainly informative, this approach can’t identify which microbes are active in the basaltic fluids. To catalog the genes used by the active community, Elizabeth and co. will also be sequencing the transcriptome, which has not yet been studied at this unique site under the seafloor in the middle of the Atlantic Ocean. In addition to metagenomics and transcriptomics, Elizabeth also incubated samples with stable isotopes to trace metabolic activity. There are a few different ways that she, Ben, and Megan tested samples: first, they took aliquots for nanoscale secondary ion mass spectrometry (NanoSIMS) stable isotope probing (SIP) to determine the distribution of active cells on a single-cell basis. 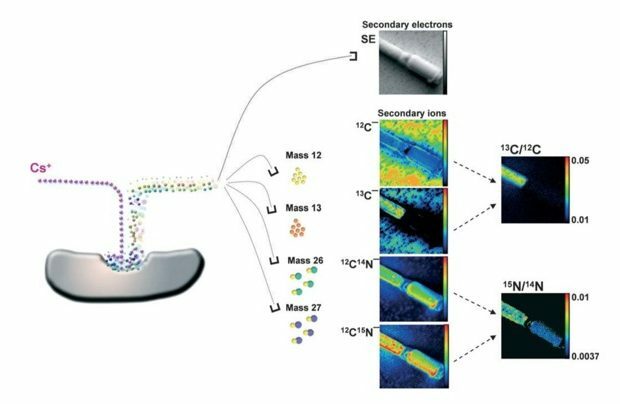 NanoSIMS is a method for essentially creating images to reveal the elemental composition of a sample at levels of resolution greater than 100 nm. Combining NanoSIMS with SIP is a slick way to get some great images of cell composition. Furthermore, using these tools in conjunction with fluorescence in situ hybridization (FISH) can even allow for identity to be linked to function in microbial communities. It’s pretty amazing that currently functional role can be teased apart at the microbial cell level. Figure 2 from Muscat et al,. Detecting metabolic activities in single cells, with emphasis on nanoSIMS (2012). A scheme demonstrating the basic principle of NanoSIMS. To prepare the fluid samples they were incubated with targeted metabolic tracers, including different carbon sources such as acetate, bicarbonate, methylamine, and even diatoms previously grown with labeled bicarbonate and nitrate. These labeled compounds will help identify what roles different microbes have in the samples. Samples were then incubated at room temperature or refrigerated, during which the actively growing microbes incorporated stable isotopes into their cells. After this incubation period, the microbes can be visualized as maps of single cells and the isotopes they contain using the NanoSIMS along with the FISH taxonomic identification tag. 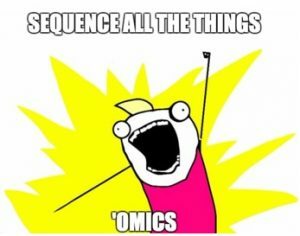 Obviously, Elizabeth still didn’t have enough to keep busy with, so in addition to the NanoSIMS-SIP method, they will also be using RNA-SIP, to link specific processes (the what) to the community characterized (the who). RNA-SIP involves incubating 1 liter volumes of samples with labeled bicarbonate. This method will allow Elizabeth to identify which genes are actively being transcribed from organisms that use CO2. As with the previous method, samples were incubated for different periods of time, but were then filtered for RNA extraction. The RNA will then be spun in an ultra centrifuge at 37,000 rpm for 64 hours to separate out the RNA made by cells that incorporated the labeled CO2, which has an extra neutron in the molecule that literally makes it heavier so it will sink lower in the tube during spinning. Researching the microbial communities under the ocean’s floor is necessary to understand the role these microbes have in global cycles. During the cruise I was lucky to get some first hand experience with the challenges and rewards of studying the fluid in basaltic aquifers under the seafloor. The experiments done by the different labs on the ship were incredibly unique and working towards unprecedented insight into processes that have a global reach. Stay tuned for the next post in this series about the cool research focused on understanding the microbial communities under the seafloor. Fortunato, C.S. and Huber, J.A., 2016. Coupled RNA-SIP and metatranscriptomics of active chemolithoautotrophic communities at a deep-sea hydrothermal vent. The ISME journal, 10(8), pp.1925-1938. Kuypers, M.M. and Jørgensen, B.B., 2007. The future of single‐cell environmental microbiology. Environmental Microbiology, 9(1), pp.6-7. Meyer, J.L., Jaekel, U., Tully, B.J., Glazer, B.T., Wheat, C.G., Lin, H.T., Hsieh, C.C., Cowen, J.P., Hulme, S.M., Girguis, P.R. and Huber, J.A., 2016. A distinct and active bacterial community in cold oxygenated fluids circulating beneath the western flank of the Mid-Atlantic ridge. Scientific reports, 6, p.22541. Musat, N., Foster, R., Vagner, T., Adam, B. and Kuypers, M.M., 2012. Detecting metabolic activities in single cells, with emphasis on nanoSIMS. FEMS Microbiology Reviews, 36(2), pp.486-511. Tully, B.J., Wheat, C.G., Glazer, B.T. and Huber, J.A., 2017. 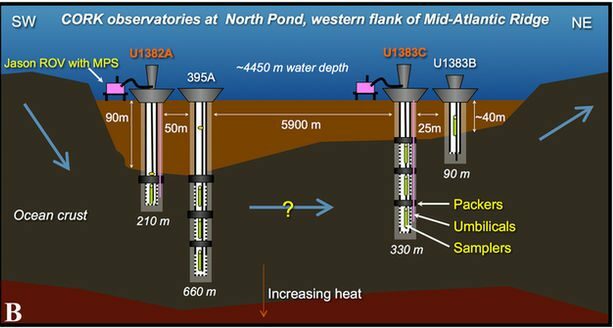 A dynamic microbial community with high functional redundancy inhabits the cold, oxic subseafloor aquifer. The ISME Journal. This entry was posted in bioinformatics, community ecology, fieldwork, genomics, metagenomics, microbiology, transcriptomics and tagged Deep sea research, North Pond, R/V Atlantis, ROV Jason. Bookmark the permalink.